Dundee have signed midfielder Lewis Spence on a one-year deal. 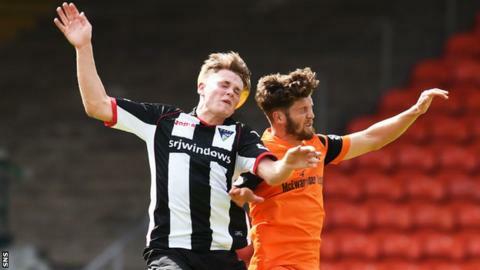 The 21-year-old leaves Dunfermline Athletic, who twice loaned Spence to Brechin City in 2016. Scot Spence has 65 senior appearances to his name and joins midfielders Scott Allan and Roarie Deacon in joining Neil McCann's side. Meanwhile, defender Kostadin Gadzhalov, 28, has signed a new one-year contract to stay at Dundee for the coming season. The Bulgarian has been with the Dens Park club since January 2015 and has made 44 appearances for the Dark Blues. He previously played in his homeland and Serbia, and follows full-back Cammy Kerr in extending his stay with the club. Of Spence's capture, McCann told the Dundee website: "I've seen enough of Lewis in my time at Dunfermline that suggests I wanted to give him a chance here at Dundee. I want to work with him to try realise the potential that I saw in him. "He knows he is going to have to work extremely hard to force his way into my first XI but if you take our new vice-captain Cammy Kerr for example, it shows how far you can go in a short space of time with drive and determination given the opportunity."